Freshen up this season with dinner salads. 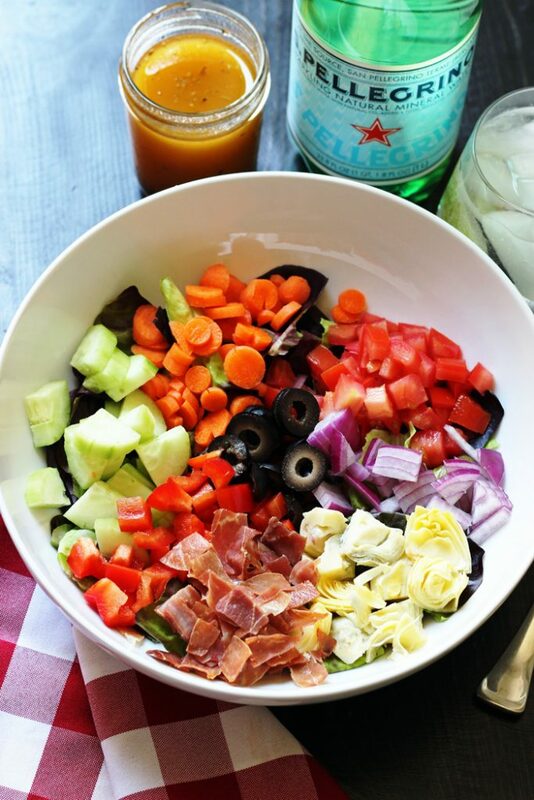 Try this Italian Salad loaded with vegetables and topped with crispy prosciutto. Vegetables are the name of the game, people. Nutritionists can argue all the live long day about paleo v. vegan v. whole grains, but one thing everyone agrees on is vegetables. We should all eat more vegetables. And so, this week I’ve got a new salad for you to try! It’s loaded with vegetables, like red butter lettuce, artichoke hearts, tomatoes, carrots, red onion, cucumbers, and black olives. I took the liberty of adding a bit of charcuterie for a little fun twist. I was told recently by a fellow food professional to “stand by a recipe” and not to offer variations. However, in this budget life, I think that variations are just as important as eating your veggies. I once thought that if I was missing one ingredient for a recipe, I would need to run to the store. And like that mouse you give a cookie to, I would invariably buy more than that one ingredient. So, I think variations are a good thing to mention. Especially for this salad. You’ll see what I mean in a moment. 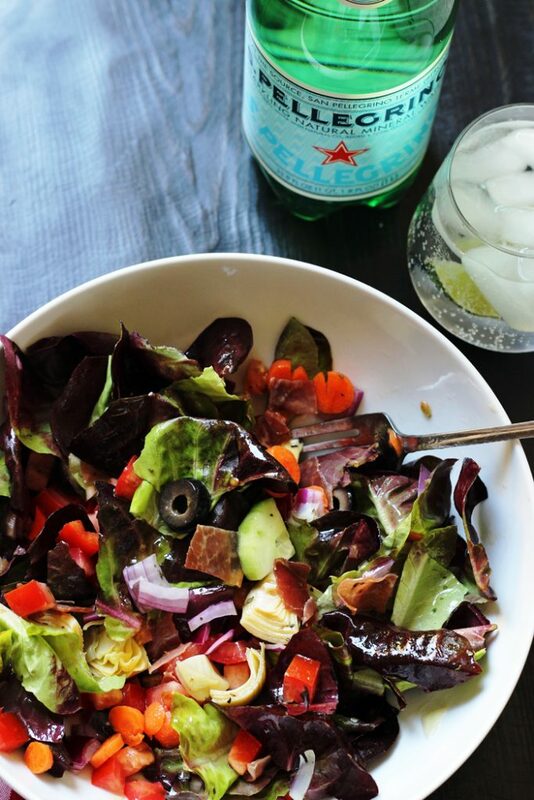 This salad was inspired by a craving for ChiChi’s Antipasto Salad. 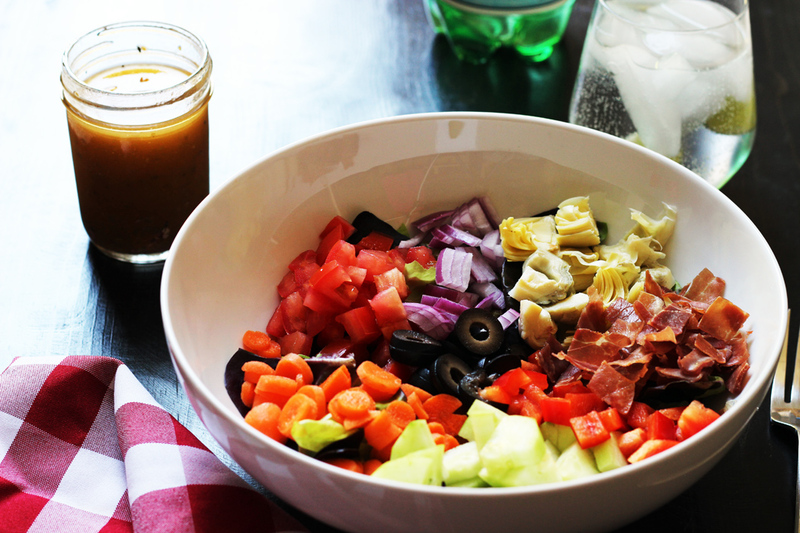 (You can see my copycat of ChiChi’s Italian Salad here.) I was raised on ChiChi’s Italian food, so its flavors are embedded deep in my DNA. The Antipasto relies on loads of meat (pepperoni and salami), beans, and cheese. It is an amazing salad. Amazing. But, I’m eating Whole 30 right now in which means those delicious, but nitrate- and nitrite-filled meats as well as the beans and cheese are off limits. While this salad was inspired by a craving, you can tell these are two entirely different salads, though both be made with good taste. If you are eating whatever you darn well please, feel free to add salami, pepperoni, garbanzo beans, mozzarella cheese, and a few pepperoncini — and God bless you. 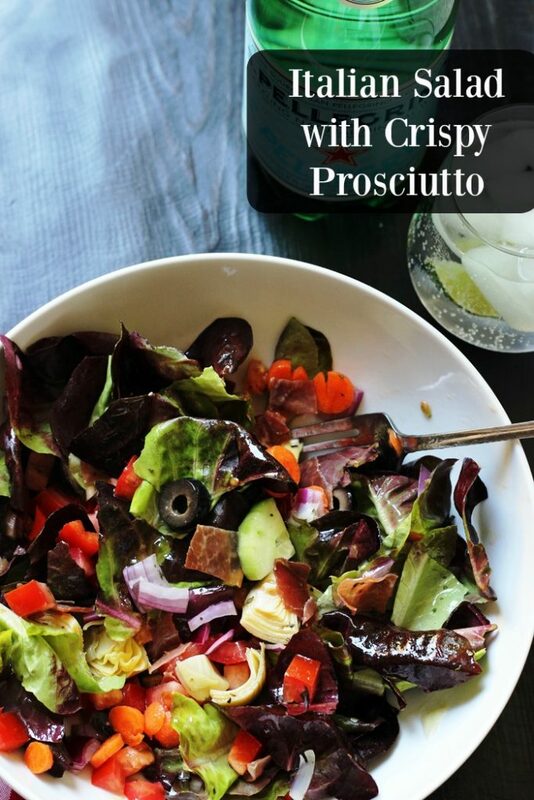 One little touch that I added was to crisp the prosciutto before adding it to the salad. This gives it a slightly different texture while still adding some meaty flavor. For all you prep-ahead people, know that you can prep all the veggies as well as the crispy prosciutto and the dressing ahead of time, but keep the dressing in a separate covered jar. If you’re packing this for lunches many days in advance, you might want to use grape tomatoes so that there’s less moisture in your salad. This recipe will serve 4 as main dish or up to 8 as a side dish. If you just want to make a salad for you, you can easily scale the recipe down to side. Just store extra dressing in the fridge. In a large dry skillet over medium heat, sauté the chopped prosciutto until crisp, stirring so it won’t burn. Remove it from the heat to cool. In a small jar with a lid or a small bowl, combine the vinegar, basil, oregano, garlic, and salt and pepper to taste. Cap and shake, or stir to combine. Add the olive oil and shake or stir until well blended. In a large bowl place the lettuce and dress with enough of the dressing to coat. Divide the greens among four dinner plates. Divide the tomatoes, cucumber, artichoke hearts, carrots, pepper, and red onion among the four plates. Divide the prosciutto among the plates. Serve immediately with extra dressing on the side. learn about my Whole 30 experiences here. I’ve never thought about crisping proscuitto. Great idea! It’s a nice way to change it up. Did you try it yet? “Stand by a recipe” and not offer variations?!? Variety is the spice of life! Also, it’s cheaper. I made this last night, only used bacon instead of prosciutto, and Jalapeno olive salad instead of olives, and zesty Italian dressing because that’s what I had. And it was great. Thanks for the ideas! This made dinner salad and I also got 5 salad jars out of what I made, so I’ve got salad for the week too.